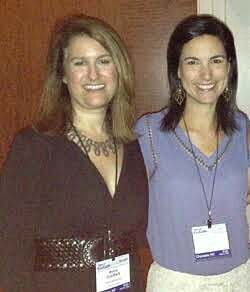 I got to catch up with Aviva recently at a blogging conference in Charlotte. Would you throw $2,000 into your trash can? The average American family throws away 20% of all food purchased, wasting hard-earned income and contributing to climate change. This is a guest post by my friend and colleague Aviva Goldfarb, The Six O’Clock Scramble meal planner. When I open the refrigerator at the end of the week, my mood can turn sweet or sour. Either I get a feeling of immense pleasure and satisfaction when I see that I have used up almost all of the food I bought the previous weekend, or I feel disappointed with myself when I toss a head of broccoli that has turned brown into the compost bin or throw out salsa that grew mold before we finished it. I look at it as a challenge – one that both saves my family a ton of money and time and cuts our food waste to almost zero. Some of my best recipes are born when I try to finish up food I’ve bought, like this Roasted Indian Cauliflower Tossed with Chickpeas and Cashews. I talk to people all the time who are disgusted by the amount of food they throw out each week and feel angst about the money that quickly adds up on each trip to the grocery store. Studies show that in the US, we waste from 25 – 40% of the food that is produced, packaged, shipped, and purchased. Food waste costs the average American family $1,365 – $2,275 each year! That’s enough money to take a vacation or beef up our kids’ college funds. The effect of all of this waste on our climate is staggering – both in terms of water wasted to produce the food and carbon dioxide emissions from transporting and disposing of food. What if we look at using up the food we buy and only buying what we need not only as a way to save money and protect the planet, but also as a practical opportunity to teach our kids flexibility, problem solving, and delayed gratification? Make it a game (think Chopped or Iron Chef). Put the ingredients you have on a table and challenge family members to get creative by transforming them into a meal using only what you already have in your kitchen. Pretend you’re in a mountain cabin and you can’t get back to the store until the end of the vacation, so you have to stretch out those ingredients. Try new recipes like frittata, pasta, stir-fry, salad, and stew that are flexible enough to use up odds and ends at the end of the week (we call this the Sixth Night Scavenge). Substitute whatever vegetables and cheeses you need to use up in this Frittata with Red Potatoes and Greens recipe. If you’re not a confident cook, type several ingredients you do have into a search bar on your favorite meal planner or search engine site. End the week with a picnic or happy hour dinner where you pull out stray ingredients, leftovers, vegetables, dips/dressings, and canned foods like sardines, tuna, or refried beans to have a casual dinner. Make a smoothie with any leftover fruits to complete your meal. Think about what you would do with an extra $1,500 OR $2,000 this year. Stick a picture on your fridge and make that your motivation. Let each family member pick a vacation destination or other reward that you could afford if you spent less money on food. Before you shop, check your calendar and plan for one less meal than the amount of home cooked dinners you hope to enjoy. That way you won’t wind up with ingredients for an extra meal if you have to punt on dinner plans one night. And even if your meals do go as planned, you’ll be left with one night each week to use up all the food you bought before you plan and shop again. These small changes to your shopping, meal planning, and eating routines can have a huge impact on your family budget, stress level, and the climate, which we need to stabilize if we want to have continued access to the foods we all love. 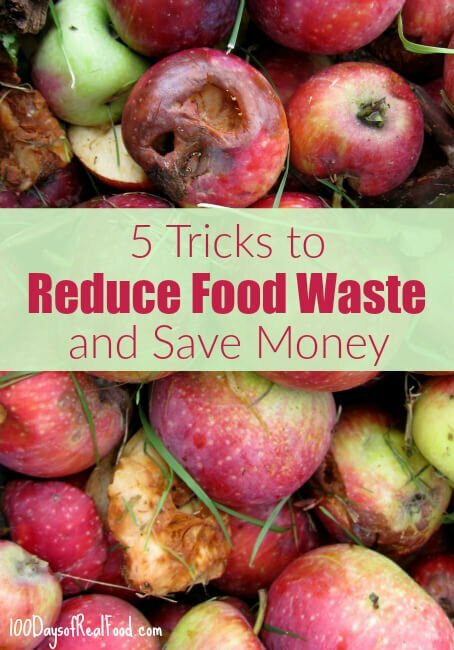 What can you do this week to reduce your family’s food waste? Please make a commitment and share your ideas below. Aviva Goldfarb struggled like many busy moms to put a nutritious dinner on the table for her family amidst the chaos of daily life. That led to her founding The Six O’Clock Scramble, an online dinner planning solution for busy parents. She is a Today Show and Washington Post contributor, author of the acclaimed Six O’Clock Scramble cookbooks, and frequently appears in major national media such as The Katie Couric Show, Real Simple, and Prevention magazine. Are expiration dates causing you to waste food? This is so good and so timely. I’m constantly testing new recipes I’ve dreamed up and I end up with so much left over (both in terms of ingredients and meals). I’ve started to pop things in the freezer, which has definitely helped (like peeled ginger, tomato paste, rice, single portions of meals, etc.). I really like your suggestion of putting a picture on the fridge to remind yourself of what you’ll do with the saved money. And, thinking of it as a game is helpful, too. It’s super rewarding to put a tasty meal together from odds and ends. Such a great suggestion to freeze more of our food before it goes bad, Katie! More Americans need to embrace composting! It cuts down on food waste and creates a product we can actually use (soil). There are so many great companies out there that can help you compost, it’s a shame more cities don’t make it a norm, like Seattle does. I’m bad at planning, but really good at using leftovers! I guess I’ll continue to try new recipes with all I’ve got from the previous day! Thanks for sharing your tips! I pretty much do the same thing. I try and cook in bulk (not too much though so it doesn’t go off). It saves time and electricity, and if you add the right seasoning leftovers can be even tastier. That last one, plan for one less meal for the week, took me awhile to figure it out. But very good idea. We always, always have something leftover or on hand for that extra meal. And sometimes it turns into the free-for-all meal (grazing). Heck sometimes it’s just cereal for dinner cuz I’m the only one home and not super hungry! So glad you found that valuable at your house, too, Amanda, thanks for reading! I have a friend that calls the “crisper” department of her refrigerator the “rot-box” because that’s what happens to almost all the veggies she puts in there. I agree making a plan helps. It keeps me from forgetting what’s in the drawers. Yes, such a waste of money and resources! Folks can also visit http://www.ivaluefood.com for more tips and tricks. Also, our friend Dana Gunders, who wrote the seminal research paper on food waste just came out with a cook book to take these ideas up a notch! “Waste Free Kitchen Handbook”. Check it out! Fantastic suggestions, Jeremy, thank you! I have started making vegetable stock out of veggie scraps and wilted but not spoiled vegetables. As I chop veggies through out the week I toss the bits into a freezer bag and make the stock on the weekend. It is one more way to get nutrients and flavor out of my food before the scraps go to the compost. That is such a great use of scraps! Do you make soup or just use the stock in your cooking? I’m pretty good about not wasting except for with oranges!! Any suggestions other that fruited water? I love adding diced oranges to our salads, with the juices from dicing them. I freeze orange slices for smoothies. My problem is using all the produce before it goes bad. I grocery shop on Friday, then hit the Farmer’s market on Saturday. I would like the produce to last till the following Friday. I plan my weeks meals according to how long I think the produce will last. I find farmer’s market produce has a fairly good shelf life. However, grocery store items can go pretty quickly like berries, sometimes even sooner then the use by dates (lettuce). Other times the produce is just plain bad quality when I cut into. Frustrating when I was counting on it for a meal. I will take things back, but it’s not worth returning say 2 avocados. I compost, but it is still money down the drain. Agree, that is incredibly frustrating. Just make sure not to wash the berries or other produce before you plan to use it for longer shelf life–you probably already know that. Also, I might add that I have a new LG refrigerator and it does keep produce longer then my old one due to better humidity control. Unfortunately my produce bins are not nearly large enough to hold all my produce. A problem with most models we looked at. Friends of ours got a Sub-Zero and say it can keep produce a full 2 weeks! We use the 6-meal per week planning strategy, as we always have some leftovers, or items we need to use up in the freezer. Also, about once every other month, we don’t do a shop at all and have a fridge/freezer clean-out week. This lets us use up all those things that have been in there for a long time and make room for fresher items. During that week, we only buy milk, butter, and one or two salad items to go with whatever we dig out of the freezer. Everything in the fridge has to be used up. It works well for us and keeps us from having things around too long. I love this idea, thanks for sharing it here! When I was growing up, my mother frequently used up the weekly leftovers by having a “draw for your supper.” She would put our names on pieces of paper, fold them up and put them in a bowl. Usually my youngest sister would draw the names. The first person to have their name drawn, got first pick of the leftovers and got whatever they liked most. Sometimes we were thrilled with our dinner. Other times, when drawn last, we were pretty sad. But it was effective in not wasting food and we all have good memories. My mom was a good cook, so it was only leftovers like liver and onions that caused us much grief. I really need to work on this – I just cleaned out my refrigerator and threw out a bunch of stuff. One thing I recently started doing that’s reduced the amount of veggies we toss is freezing anything I cooked up for a meal but that we don’t finish, and I’ll use them the next time I make soup. It will be less to cut up when it’s time to make soup, and I’ll have a much larger variety of veggies than I would have put in the soup otherwise. This probably could be done with uncooked veggies that you may not get to before they die, too – you can freeze them and then cook them in the soup. I needed to read this a week ago! I’m newly single and still shopping for more…I just dumped a LOT of produce that didn’t get eaten. I have a full freezer already and no room for more leftovers; as much as I hate the idea, I’m going to have to buy smaller packages. It will cost more in outlay, but hopefully, not as much as I waste by tossing out half of a larger package! I use rollover meals a lot. Like our go-to of pinto beans one night, added into the chili for the next night, then add more ground beef and taco seasoning and the third night is burritos or taco salad. It saves us a lot of money when we cook enough for leftovers and then roll it over. I recently purchased a new fridge and didn’t think to check to see the INTERIOR measurements….it’s MUCH smaller….that quickly forced me to be a better shopper and planner! 2. Panini Sandwiches — roasted or cooked veggies, spinach or greens, deli meats, cheeses, jarred pesto, etc. 3. Pizza — We make this on pre-prepared Naan breads…We’re VERY adventurous with our pizza toppings….serve with a “garbage salad” of crisper drawer items. 4. Nachos — Take chip of choice and add leftover reheated shredded meats (BBQ, Pot-Roast, anything!) add shredded cheeses, olives, peppers, etc…yum! 5. Baked Potatoes — A baked potato bar can seriously blow through a pile of cooked broccoli, cauliflower, cheese, diced ham…. What excellent suggestions for using food before it goes bad! I am prone to freeze leftovers in individual serving sizes when we aren’t going to use them and then I can have an easy lunch later. For those times when we are a dollar late and the food has turned bad we try to compost, which is a way to reuse it instead of throwing it away. It doesn’t work for everything, but it’s a start. Thanks for the great tips Lisa! I grew up making everything from scratch, many items homegrown, so preserving food (canning,freezing,drying)was in my blood. With my family, and at the time home daycare, I was very good at carefully planning & shopping/cooking accordingly. With a now empty nest, I have found it so much more difficult to do so. I detest waste!! And, I don’t like using prepackaged things like 1/2 melon, mixed fruit or veggie packs, who knows how ‘clean’ it is… Plus it costs more. So my favorite suggestions now, especially for small households, is to try to find someone to pair your fresh food shopping with. I like variety, but if I buy 3 different kinds of melons to have a mixed fruit dish, or to juice, I simply can’t eat them all before they spoil. Having someone to split it with benefits you both. I utilize the freezer, if I use 1/2 banana on my oatmeal, I cut up the other 1/2 & place on a plate to ‘flash freeze’ then place in a baggy to use in future smoothies. Sometimes I freeze things like cucumber, lemon slice, melon balls in ice cube trays with water or juice, to use in smoothie or just to flavor ice water in the future. Fresh garlic & Herbs are items that can be wasteful, so I chop up and freeze in ice cube trays, can use any oil, broth or just water. These work great in future soups etc., If you used oils, you can use these whenever you are cooking and the recipe calls for oils, and chopped herbs. I like making my own garlic/herb butter (sometimes with grated cheese) and can soften a cube to spread on bread/roll to make single serving garlic toast. I do this with other meats and fish too. Can make your own vegetable version as well if you collect & freeze your excess before it gets wilted or spoils. OMG! Glad I came across this post. I’ve been thinking on how to reduce food waste since most of my housemates are working, they rarely eat at home. Thanks for the tips. I will surely keep them in mind. These are really nice tips! I’m recently trying to explain to my kids how important it is to reduce our food waste and how important is this for environment and other people. Your suggestions gave me some more good ideas to try out with my family. Thank you for sharing this great information! For those discussing composting, consider checking into your city waste pickup before purchasing a compost bin. Our city includes yard waste pickup with garbage pickup (no yard bags, just put it in the bin), and they have the end-product compost available for free up to a ton per trip. This allows me to put all my scraps in the bin and just make a few trips each in spring and fall to replenish my garden for nothing more than my waste pickup fee (which is there whether is use it or not). We are the world’s worst about wasting meat, and considering we buy organic meat this is beyond wasteful. We have a toddler in house, and when she is having a bad day, no cooking can be done. I am disabled and can’t cook and can’t mind said toddler, and my daughter is a single mom. This means there is one cook and one housecleaner around here. Sometimes all the balls cannot be juggled by my sweet girl. I’m really not sure what the solution is. I love what you are doing and love your ideas, especially the picnic / happy hour dinner. That can clear a lot of items from my fridge. If I may add something to this list, it would be using Fresh Salad bags. Fresh bags are reusable and they will keep vegetables fresh and crisp up to 10days. I keep washed mushroom and lettuce in them for sometimes more than 10days. Since using these bags we have reduced our produce waste by 90%. I like the commitment not to shop till the following weekend. And having pancakes with all the odds and ends made into fillings works really well – savory and sweet. Using the freezer has really helped us waste less meat. I freeze it either cooked or raw so I only have out what we need ready to cook. For produce, I stopped buying canned fruit (which my kids never ate well anyway), so we use up the fresh snack fruit I buy each week. Canned food is not all bad in our home, though. Canned and frozen vegetables are my go to for sides, and I find that we eat more produce and waste less produce this way. I always have high hopes for cooking up a bunch of fresh veggies, but sometimes the realities of one’s life must fit in to the overall healthy food picture! This is such an important topic. Many people are simply not aware of just how much food they scrap on a daily basis so I salute you for highlighting the issue in such an informative way. I was just cleaning out the fridge today and thought of a couple helpful things: I grouped all the “leftovers” on one shelf in see-through containers so I could see what all we need to use up. I could easily assess that I have the perfect fixings for a delicious salad for my lunch tomorrow (leftover grilled chicken, extra hardboiled egg, leftover salad from tonight’s dinner). My husband will have a very nice lunch, including a bowl of soup for a “starter” (leftover from last night’s dinner) and leftover salmon and spinach rice alfredo from tonight’s dinner! (And I actually used “leftover” rice to make the rice alfredo!) I do a freezer/pantry/fridge inventory every month and this helps me to evaluate what I have. We also do a “CORN” (Clean out refrigerator night) at least once a week. I don’t have to cook, and we don’t waste food. Win-win!!! I freeze bananas that are getting brown for smoothies, or use them to whip up some banana bread. Also, usually twice a year (generally in January and July along with Jessica Fisher of “Good Cheap Eats”) I do a pantry challenge where I try to use up what we already have in the pantry/freezer/fridge instead of buying more. I usually save a couple hundred dollars that way!!! I freeze single servings of some leftovers, such as chili or soup to be used as convenience meals for myself sometime within the next month. Plus, with the right seasoning leftovers often taste nicer than when cooked fresh.